Enhance your performance with Skyscanner Travel Intent data targeting. This is a guest blog by Advertising Principal Commercial Manager, Nick Fisher. Nick has worked in digital media for the last 19 years and been with Skyscanner for the last four. He currently leads programmatic advertising sales, and leads the Data Leasing strategy for partners. If you are interested in finding out more about how we use Travel Intent data at Skyscanner, you can reach out to Nick on LinkedIn. One of the most common questions we get asked from advertising partners is how can they get their product messages in front of audiences who are planning to travel. We have always offered opportunities to target advertising as the traveller actively searches for travel, but that is only one answer. Today, as a traveller searches Skyscanner for Flights, Hotels or Car Hire we capture the key data about where they are planning to travel, how many people they are travelling with, when they are looking to travel plus other data from their searches, we are then able to use this data to create Travel Intent Audience segments and use them to target advertising to potential travellers. When the search shown below is conducted, the traveller is placed into a number of segments as illustrated (e.g. Region: Europe, Depart: March etc.). Audience targeting is one of the most effective ways increase an ad campaign’s share of voice to highly relevant audiences – even after they have left the Skyscanner site. Here are some of the ways you can use Travel Intent data for audience targeting with Skyscanner. To engage with travellers after their initial search, Travel Intent data can be used for the targeting of standard Direct Guaranteed campaigns. 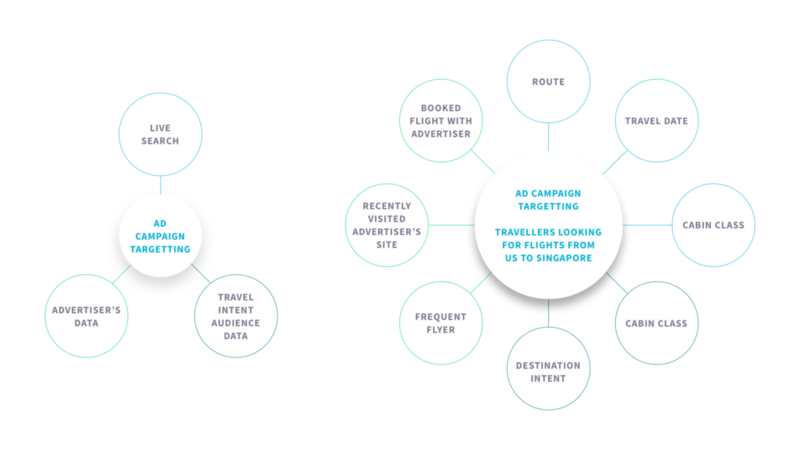 For partners that want to combine their own data on travellers with Skyscanner audience targeting, a Programmatic Guaranteed campaign can be used. This campaign type is ideal for targeting ‘known travellers’ such as frequent flyers or recent visitors to a partner site with specific ad creatives. With a Skyscanner Audiences campaign, ads can be targeted to travellers on Skyscanner and on other sites. Using audience intent segments ensures that ads are only shown to relevant audiences who have the intent to travel to (a) specific destination(s). Travel Intent data can also be used to power programmatic buying. We can enable audience segments to be used directly within a DSP (such as DoubleClick Bid Manager) as a trusted audience data source. Over the last 6 months there has been a major shift in the amount of advertising using audience data. I see this as a clear indicator that data driven marketing techniques are becoming the standard way to run ad campaigns and that finding data sources that you trust will be just as important as finding the right sites to run ads on. Ready to grow your share of voice and return on your advertising investment?